Researchers are increasingly demanding that test conditions closely mimic real-world environments in order to provide the most reliable, accurate prediction of mechanical properties. The NanoTest Xtreme provides a vacuum environment for testing up to 1000 °C. This cutting-edge technology facilitates the investigation of next generation engineering materials. Applications include tool coatings for high speed machining, high temperature aerospace engine components and irradiation effects in nuclear reactor cladding. Nanoindentation is ideally suited to further the development of high-temperature materials, such as the (Ni,Co)CrAlY bond coats protecting nickel-based superalloys in turbine blades. Until very recently, the operating temperatures of these materials were out of reach for nano-indentation systems. However, the unique geometry of the NanoTest Xtreme, along with the localised heating zone, allowed scientists at RWTH Aachen in Germany to push testing temperatures up to 1000 °C and gather valuable information on the hardness and creep behaviour of an Amdry-386 bond-coat  (see figure 1). 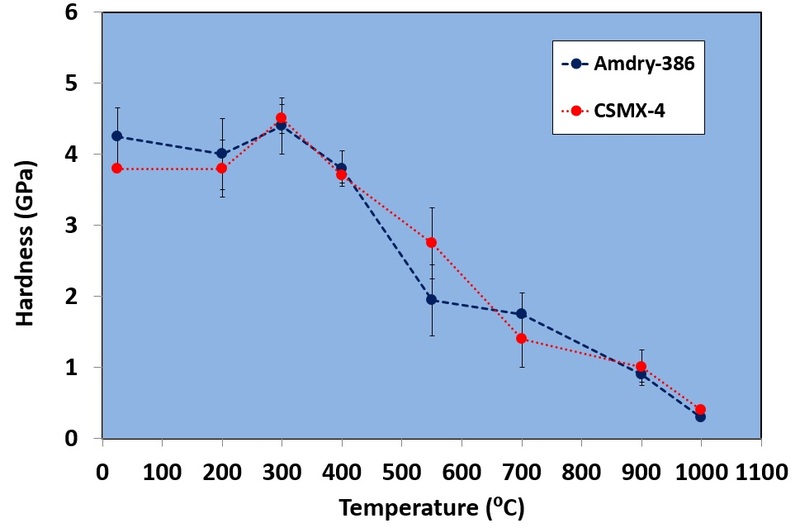 Figure 1 – Temperature dependence of hardness over the range 25 – 1000 °C for Amdry-386 bond coat and superalloy substrate. When measuring at elevated temperatures, it is essential that the sample and indenter are the same temperature when the indentation takes place . Any mismatch will result in excessive thermal drift, an error on the measurement caused by an expansion or contraction of the sample, indenter or instrument. Figure 2 – The horizontal high temperature configuration of the NanoTest. 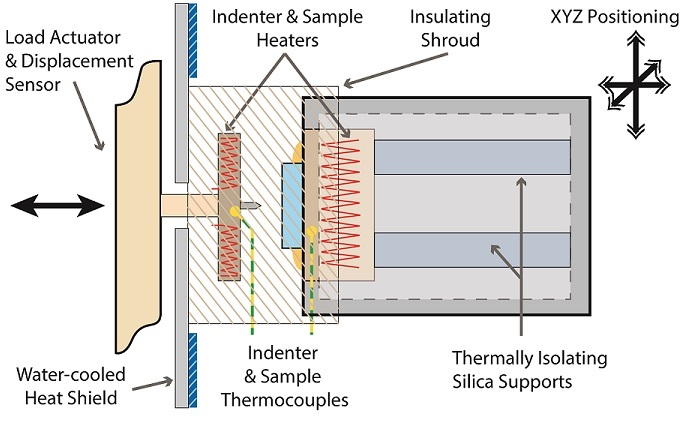 Active tip heating – the indenter and the sample are both actively and independently heated, resulting in an isothermal contact before the experiment begins. Horizontal loading – the unique load head configuration of the NanoTest systems means that there is no heat flow onto the loading head or depth measurement sensor. Highly localised heating – a heat shield and insulating shroud around the heated zone ensures instrument stability during high temperature experiments. Patented control protocol – software routines are used to precisely match the indenter and stage temperatures to within an accuracy of 0.1 °C. Time-dependent measurements – As no significant thermal drift occurs during high temperature measurements it becomes possible to perform long duration tests such as indentation creep tests. With its localised heating design of the NanoTest Xtreme, the rest of the instrument remains only a few degrees above room temperature. A key benefit of this is that the SPM-nanopositioning stage can be used throughout the full temperature range. Images acquired at high temperature enable precise indentation positioning at temperature or targeting of specific features such as pillars for micro-compression tests or cantilevers for micro-scale bending experiments. Researchers from the Department of Materials at the University of Oxford used a NanoTest Xtreme to perform bending tests on micro-scale cantilevers up to 770 °C using a cubic Boron Nitride indenter . Temperature was accurately matched by use of independent indenter and sample heating. The high temperature images with the SPM-nanopositioning stage were used to position the indenter and perform micro-cantilever bend tests (Figure 3). Figure 3 – Image of a micro-cantilever FIB-milled on Si. The image was acquired with the integrated SPM nanopositioning stage at 700 °C. The tests enabled temperature dependent modulus, yield stress and fracture behaviour to be determined and differences in ductility with increasing temperature to be investigated (Figure 4). With advances in test instrumentation, mechanical characterisation at operating temperatures is becoming more commonplace in materials development for safety-critical sectors such as the nuclear industry. Tungsten and its alloys are being considered as the main plasma-facing material in a fusion reactor. In collaboration with scientists at the University of Oxford the NanoTest Xtreme has been used to test the mechanical properties of tungsten in high vacuum to 950 °C [2,4,5]. Testing under high vacuum was essential as tungsten oxidises rapidly above 500 °C in air. The strain rate sensitivity determined by analysis of indentation creep data increased with temperature. More significant time-dependent deformation was observed from 850 °C. 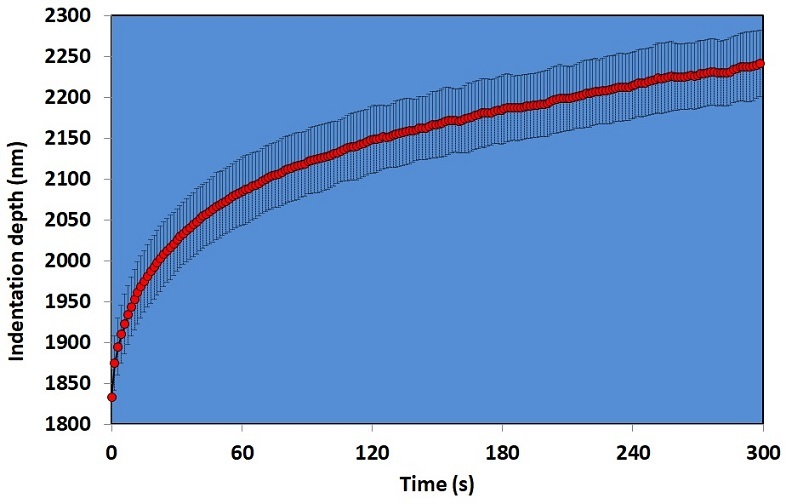 With thermal drift at 750-1000 °C typically as low as 0.05 nm/s the NanoTest has the stability to run longer duration indentation creep tests throughout the temperature range (Figure 5). 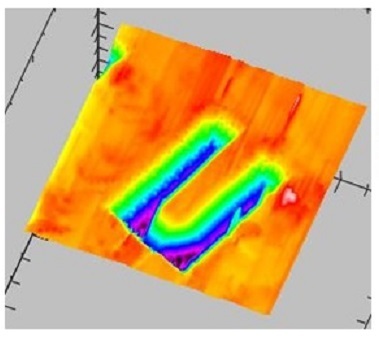 Figure 5 – Development of indentation creep during 300 s at 945 °C on tungsten. Mean and standard deviation from 3 repeat tests at 200 mN. On extracting mechanical properties from nanoindentation at temperatures up to 1000 °C, J.S.K.-L. Gibson, S. Schröders, Ch. Zehnder, S. Korte-Kerzel, Extreme Materials Letters 17 (2017) 43-49. Nanomechanics to 1000 °C for high temperature mechanical properties of bulk materials and hard coatings, B.D. Beake, A.J. Harris, Vacuum 159 (2019) 17-28. Bend testing of Silicon Cantilevers from 21 °C to 770 °C, D.E.J. Armstrong and E. Tarleton, JOM 67 (2015) 2914-2920. Development of high temperature nanoindentation methodology and its application in the nanoindentation of polycrystalline tungsten in vacuum to 950 °C, A.J. Harris, B.D. Beake, M.J. Davies, D.E.J. Armstrong, Exp. Mech. 57 (2017) 1115-1126. 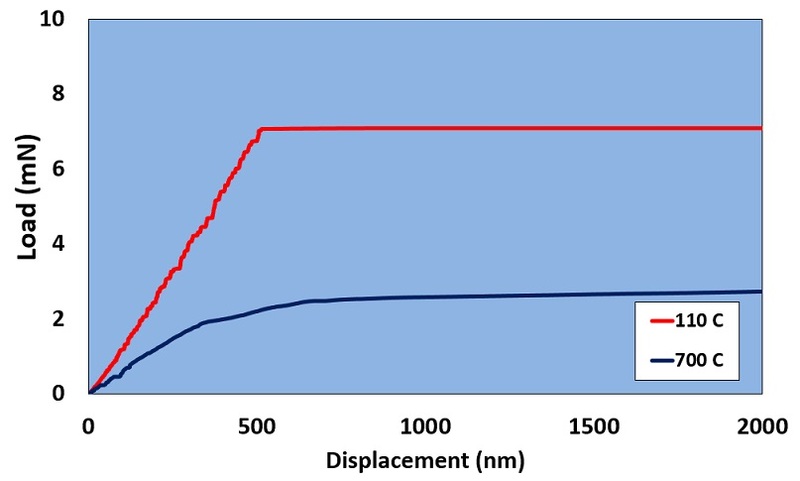 Temperature dependence of strain rate sensitivity, indentation size effects and pile-up in polycrystalline tungsten from 25-950 °C, B.D. Beake, A.J. Harris, J Moghal and D.E.J. Armstrong, Materials & Design 156 (2018) 278-286.